This Apple Walnut Pie recipe is made from scratch. Super easy to make. Just 9 ingredients and 20 minutes of active prep time. Perfect for Thanksgiving. 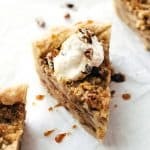 Thin apple layers which are sweet and soft are laying comfortable in a buttery and flaky pie crust and are covered with a crunchy and nutty walnut topping. 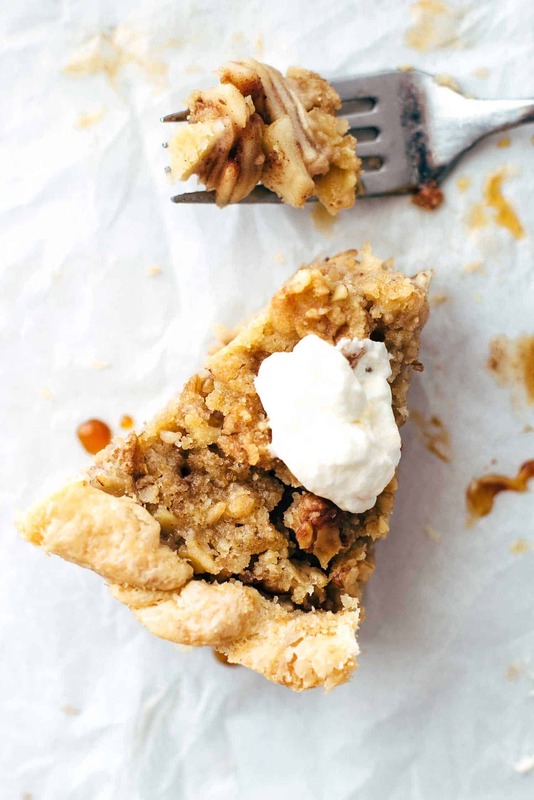 This, guys, is my favorite Apple Walnut Pie recipe and it comes right in time for Thanksgiving preparation. If you are not that in love with walnuts, you could also use pecan nuts for the topping instead. The crunchy top is sweet and a tiny bit salty what comes perfectly along with nuts. Are any other nuts in your mind for the topping right now? Great! I would love to hear about. 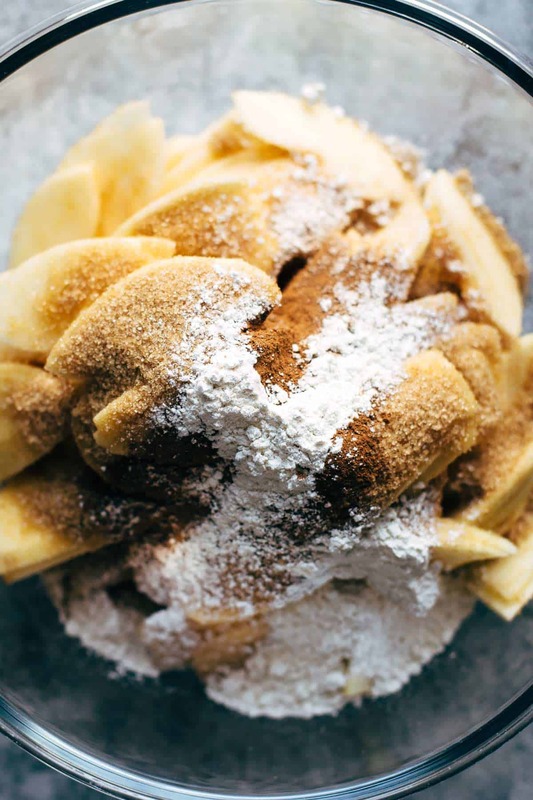 Juicy and sweet apple slices which have an intense flavor of cinnamon? Drooling! Because the slices are thinly sliced, you don’t need to cook the apples before baking to have them soft. Just slice the apples and combine them with all other ingredients and let them stand for about 15 minutes. 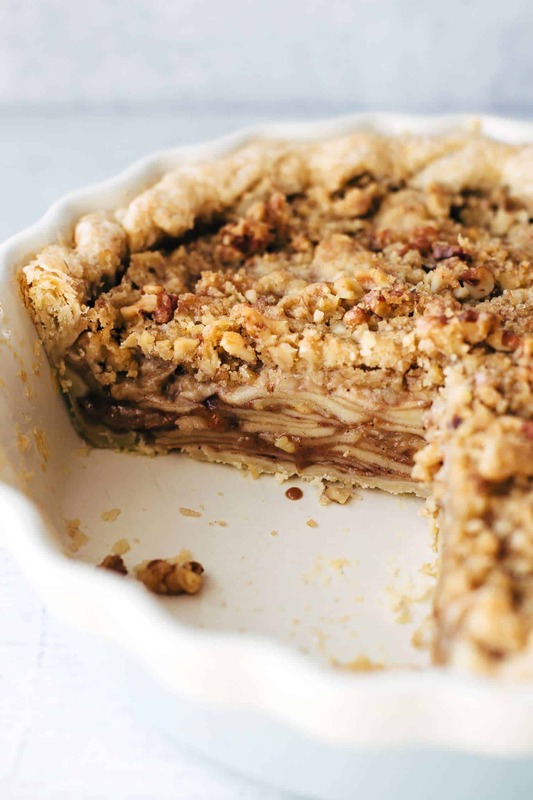 Are you already hooked on this Apple Walnut Pie recipe? The pie crust is my new go-to pie crust. Just 4 ingredients and a food processor required. 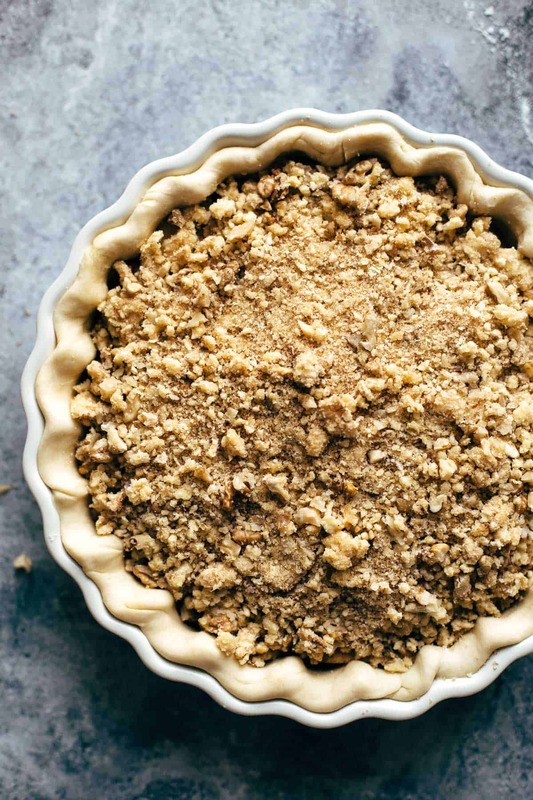 It is a super easy to make pie crust, so there is literally no excuse to use store-bought pie crust. Buttery, flaky, and so easy. Do I need more arguments to join the make-pie-crust-from-scratch-club? 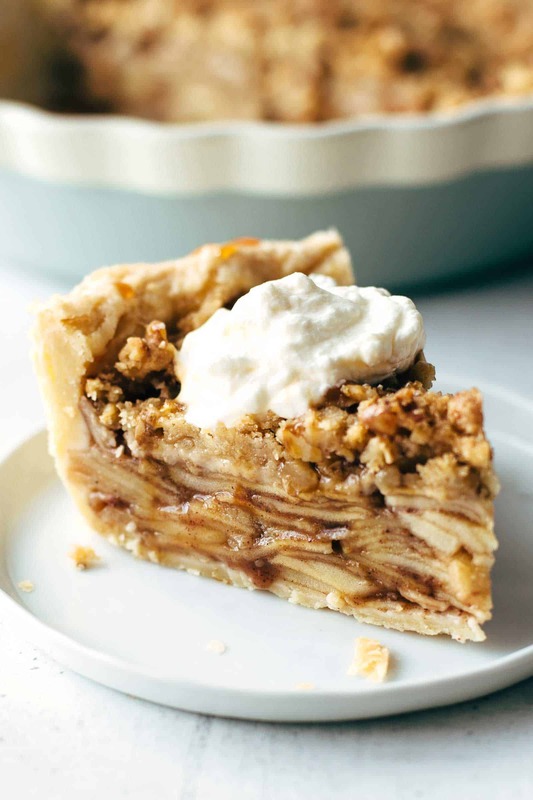 If you are looking for a dessert for Thanksgiving, I highly recommend this Apple Walnut Pie recipe. Enjoy it and happy Thanksgiving, friends! 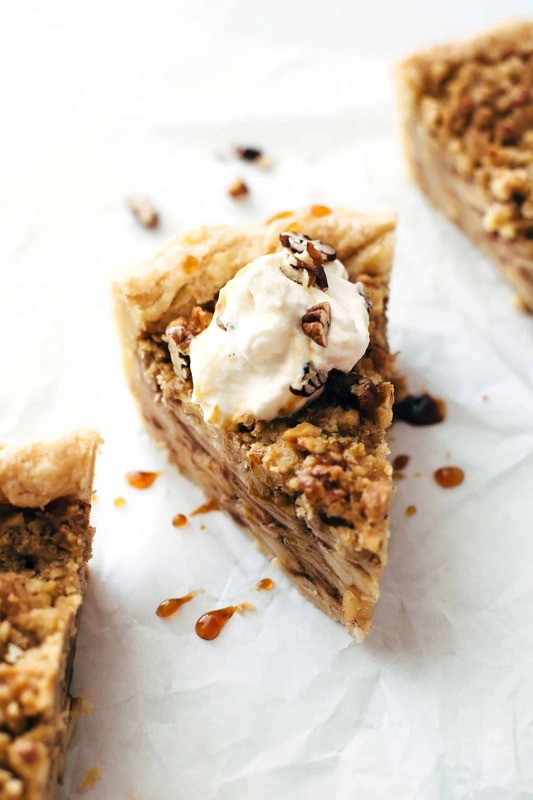 If you make this Apple Walnut Pie recipe leave a comment, rate it and tag a photo #alsothecrumbsplease on Instagram! Would love to see your snap! Make the crust: Put cold butter, flour, and salt in your food processor and pulse 4 times. Pea-sized butter flakes should be still visible. Add one tablespoon water after another and pulse 1 time after every tablespoon. Give it a few kneads and wrap crust in plastic. Let rest in the fridge for at least 1 hour, but you can also make it one day ahead and chill overnight. Make the filling: In a large bowl stir apples, brown sugar, cinnamon, flour, and lemon juice to combine. Set aside. Make the topping: Put walnuts, brown sugar, flour, butter, and salt in a food processor and pulse into fine crumbs. It's when a few bigger walnut chunks remain. Let stand for about 15 minutes. Preheat oven to 350°F (175°C). On a floured work surface roll out pie crust to a 12 inches diameter. Transfer to a 9-inch pie dish. Then spoon the apples into the pie crust and discard the leftover juices. Sprinkle topping on top. Bake for about 45-50 minutes. Cover the first 25 minutes with parchment paper on top to prevent the edges from browning too much. Let cool to room temperature before serving. Cover leftovers tightly and store in the fridge up to 3 days. this recipe sounds delicious! and I love your pictures! makes it even more appealing to the eye! Corinna, this so kind! Thank you very much. Thanks for the fantastic recipe! We shared it over on our blog Flaky Bakers today! Your pie is just gorgeous, Becky! I’m happy that you like the recipe. Thank you so much!